At least they didn’t cut her mic. 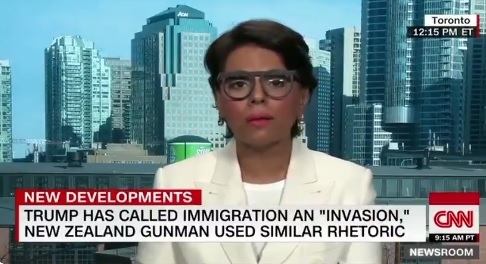 Dr. Qanta Ahmed went on CNN to discuss the horrific mosque shooting on Friday. During the discussion she was asked about how this administration is viewed in the Muslim world. Dr. Ahmed defended the Trump administration and told the CNN host how Muslims in Oman, Iraq, Egypt, etc loved the Trump administration. Dr. Qanta Ahmed: You should know this president and this administration is often castigated as Islamophobic, but I move in the Muslim world, in Egypt, in Oman, in Jordan, in Iraqi Kurdistan, where this president is beloved. This president and the Republican Party going back to George Bush is very dearly held. CNN quickly cut the segment and moved on.